Manipur Public Service Commission (MPSC) is going to conduct Manipur Civil Services Combined Competitive (MCSCC) Preliminary Examination. 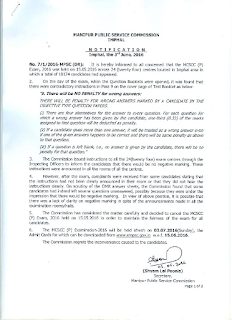 The written exam is scheduled to be held on 03 July 2016. Earlier Manipur Public Service Commission had completed the process of getting applications. The admit card of MPSC Manipur Civil Services Pre exam is available now. You can download MCSCC Exam Admit card from link below. 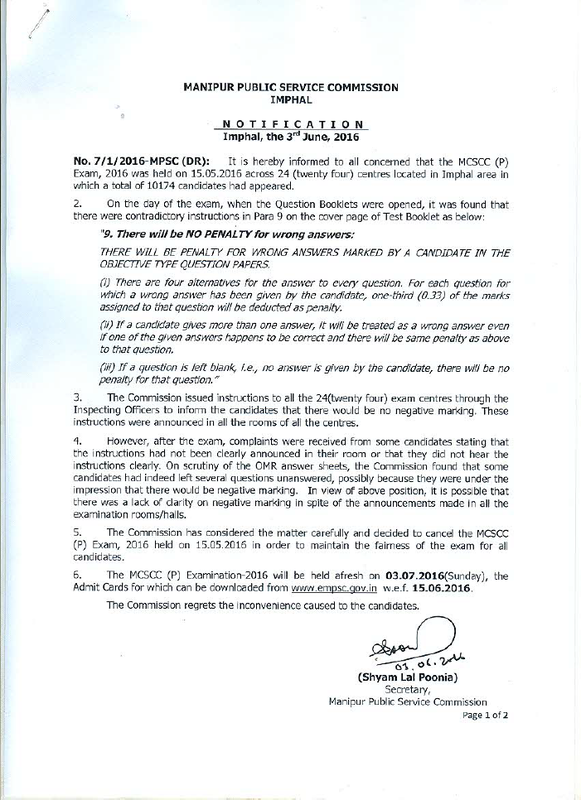 MPSC Manipur is going to conduct written exam on 03 July 2016 for Civil Services posts. For that, admit card are going to be released soon. Candidates have to download MCSCC admit cards from the official website mpscmanipur.gov.in. You will find your test centre address, timing, roll no. etc. shown in the admit cards. To download the admit card of MCSCC Pre Exam, just visit the below given link. You have to enter your candidates need to enter their registration details and click submit. Their MCSCC Admit card 2016 will be shown on the site and then you can take a print of it. Earlier MPSC Manipur had invited applications for Civil Services exam for recruitment to 82 posts in Manipur Civil Service, Police Service, Manipur Secretariat Service/Section Officer and Election Officer, Sub Deputy Collector through advt. no. 05/2015 dated 29.12.2015. Earlier this pre exam was to be held on 15 May but later re-scheduled to 03 July 2016 (Sunday). MCSCC Admit card is available only at site www.empsconline.gov.in. No Admission Certificate will be sent by post. The e-admission certificates can only be downloaded from official website link given above.